Is it possible to generate fuel from waste? Converting organic waste to fuel has failed to be economically viable to date. Increasing amounts of energy and very high temperatures are needed. Researchers at the Technical University of Munich (TUM) have now used a unique catalyst concept to significantly reduce the energy and temperature requirements of a vital step in the chemical process. The trick here refers to the fact that the reaction occurs in extremely confined spaces inside zeolite crystals. A lot more electricity is produced decentralized using hydro, wind and solar power plants. It thus makes sense to decentralize chemical production, as well. Theoretically, any municipality could produce its own fuel or fertilizer. This indeed has not been achieved up until now since chemical processes need a huge amount of energy, which is more than that provided by local renewable energy sources. “We thus aimed at finding new processes to lay the foundations for the distributed production of chemicals, which can be powered using renewable energy sources,” explains the Chemist, who is also Director of the American Institute for Integrated Catalysis at Pacific Northwest National Laboratory. One requirement for a turnaround in chemical production has now been fulfilled by his team. Through laboratory experiments, the team demonstrated the possibility of drastically reducing the temperature needed for splitting carbon-oxygen bonds in acidic aqueous solution by using zeolite crystals. The process also took place in a much faster manner than without the zeolite catalysts. The reference for the development of the new process was provided by nature. Enzymes with tiny pockets in their surface speed up chemical processes in biological systems. We thought about how we could apply theses biological functions to organic chemistry. 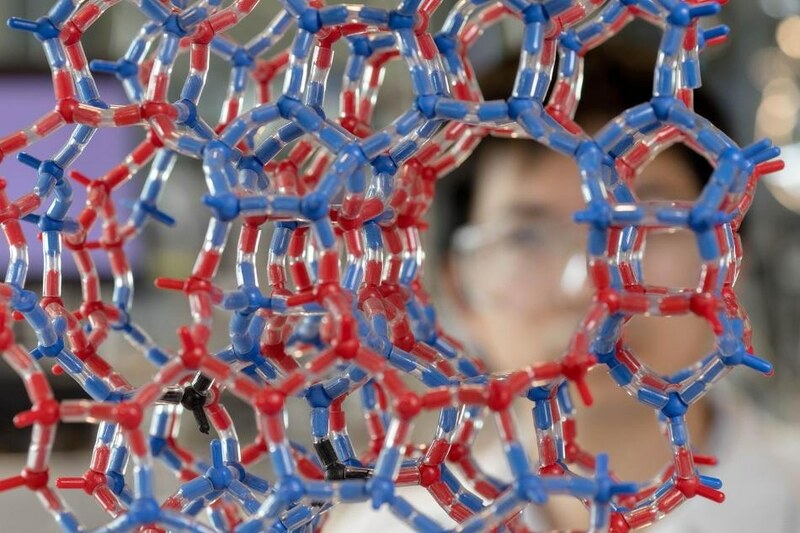 While searching for suitable catalysts that accelerate the reaction, we stumbled upon zeolites – crystals with small cavities in which the reactions take place under cramped conditions comparable to those in enzyme pockets. Do cramped quarters actually increase the reactivity? In order to answer this question, the reactions of carbon compounds were compared with acids in a beaker to the same reactions in zeolites by Lercher’s team. As an outcome, reactions run up to 100 times faster and at temperatures just more than 100 °C in the crystal cavities, where the reacting molecules, for instance alcohols, meet upon the hydronium ions of the acids. Why do tight spaces promote the reactivity of molecules? The force that improves the reaction path is the same as the one that causes wax to stick to a tabletop and that allows geckos to walk on ceilings. The more contact points there are between two surfaces, the larger the adhesion. In our experiments, the organic molecules, which are in an aqueous solution, are literally attracted to the pores in the zeolites. Thus, the hydronium ions present within the cavities have a majorly greater probability of bumping into a reaction partner than those outside. This results in an acid catalyzed chemical reaction that occurs with lower energy input and in a faster manner. Organic molecules such as alcohols lose oxygen when they come into contact with hydronium ions. This allows the process to be ideal for transforming bio-oil obtained from organic waste into fuel. The work was developed in a collaboration of the Chair for Technical Chemistry II and the Catalysis Research Institute at the Technical University of Munich with the Pacific Northwest National Laboratory (PNNL). They received funds from the U.S. Department of Energy (DOE). Some of the NMR experiments were carried out at the PNNL's Environmental Molecular Science Laboratory (EMSL). Computing time for simulations was provided by PNNL’s National Energy Research Scientific Computing Center (NERSC). Query: Will natural zeolites found in huge mineral deposits throughout the southwestern U.S. create the catalytic effect to decentralize chemical production processes in order to generate fuel from waste or are synthetic zeolites the only source?